Have you ever walked across a carpeted floor and gotten a shock when you touched a doorknob, table, counter, or even another person? You see, humans can't feel a static shock until it is several thousand volts strong, but it takes less than 30 volts to damage a sensitive computer component such as a stick of RAM or a processor. That's why computer technicians and home computer builders have to guard their computers against the deadly ravages of static electricity, as well as take steps to avoid injury to themselves. A shock that you can't even feel can seriously damage your homebuilt computer before you're even finished building it. Always use an anti-static kit when working on a computer except when working on monitors (more about that below). One end is an elastic band that fits around your wrist and which is connected to an alligator clip by a wire. The clip connects to a metal part of the computer chassis, which equalizes the voltage between you and the computer, thus avoiding static sparks. Better anti-static kits also include a rubberized anti static mat that is placed below the computer while you are working on it. This not only provides better anti-static protection, but also protects your table from scratches. When possible, try to avoid working in carpeted areas. Walking on carpeting greatly increases static buildup within your body. Always grasp a metal part of the computer chassis with your bare hand before you touch anything inside. 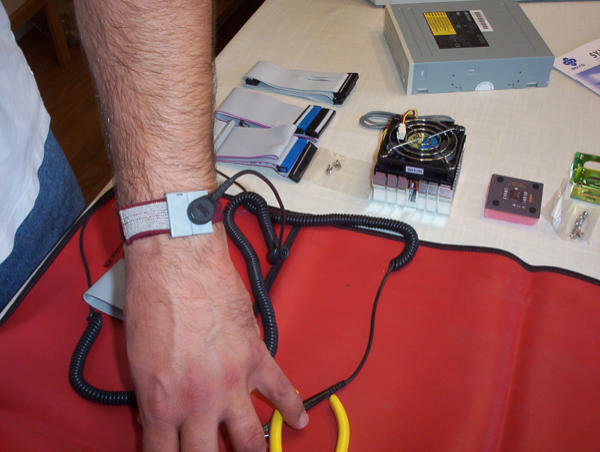 Do this even if you are wearing an anti-static wristband. The idea is to equalize the voltage between your body and the equipment you're working on to reduce the chances of static arcing. Always handle electronic components by a non-conducting (non-metallic) edge. Don't touch the pins or other connectors. Never plug an ATX power supply into AC power unless it is connected either to a computer's motherboard or to a dummy test load. You will burn out the power supply if it has no load. Always use a UL-approved surge protector or an uninterruptible power supply that incorporates surge and spike protection. Never eat, drink, or smoke while working on a computer. I suspect that some readers of this site may never have seen a CRT monitor and are wondering why I even mention them. The answer is that when this site was first built, CRT monitors were the norm; and because this section is safety-related, I figure I may as well leave it here. Who knows. It may save a life. Never, ever, ever use an anti-static wrist strap while working on an old-fashioned CRT monitor, even if it is unplugged. CRT monitors operate on very high voltages -- sometimes as high as 40,000 volts -- and their capacitors can hold these voltages for a very long time even when the monitors are unplugged. I should add that this also goes for old-fashioned CRT televisions. To put things very simply: If you happen to touch a CRT monitor's charged flyback transformer or its anode while you are grounded to the monitor's chassis by a wrist strap, even if the monitor is unplugged, you probably will die. No joke. I'm very serious about this. So don't do it. Even when CRT monitors were the norm, professional computer technicians rarely worked on them; and you shouldn't, either. Call your neighborhood TV repair shop instead. Most TV repair shops are happy to repair computer monitors. They're also more likely to have any needed parts on hand. An LED or LCD monitor doesn't require nearly as much voltage, and you should wear an anti-static strap when working on them (while they're unplugged from the power, of course). But unless you're an advanced sort of geek, you should probably leave monitor repairs in general to a professional. Although they tend to be easy to actually fix, the diagnosis of LED or LCD monitor problems can be tricky. Most times the problem is either a failed inverter or a failed back-light bulb; but there can also be other causes, including software problems. Diagnosis, therefore, can be very tricky, even if the actual repair is easy.